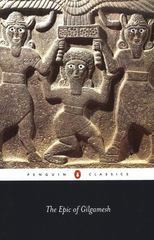 The Epic of Gilgamesh: An English Verison with an Introduction 1 Edition N. K. Sandars's landmark translation of one of the first and greatest works of Western literatureGilgamesh, King of Uruk, and his companion Enkidu are the only heroes to have survived from the ancient literature of Babylon, immortalized in this epic poem that dates back to the third millennium BC. Together they journey to the Spring of Youth, defeat the Bull of Heaven and slay the monster Humbaba. When Enkidu dies, Gilgamesh’s grief and fear of death are such that they lead him to undertake a quest for eternal life. A timeless tale of morality, tragedy and pure adventure, The Epic of Gilgamesh is a landmark literary exploration of man’s search for immortality.N. K. Sandars’s lucid, accessible translation is prefaced by a detailed introduction that examines the narrative and historical context of the work. In addition, there is a glossary of names and a map of the Ancient Orient.For more than seventy years, Penguin has been the leading publisher of classic literature in the English-speaking world. With more than 1,700 titles, Penguin Classics represents a global bookshelf of the best works throughout history and across genres and disciplines. Readers trust the series to provide authoritative texts enhanced by introductions and notes by distinguished scholars and contemporary authors, as well as up-to-date translations by award-winning translators.